Look out! It’s October again and animals are un-caged and dangerous! All throughout October, I’ll be reviewing horror movies that revolve entirely around animals gone bad. 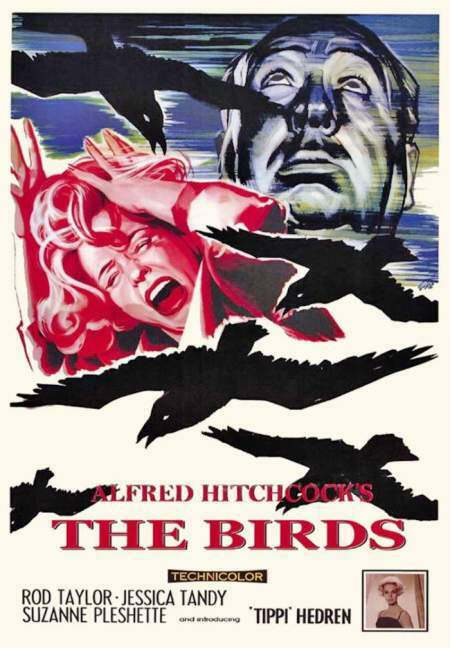 That’s right, Sharks, Bats, Spiders, Gorilla’s, Snakes and other animals are all on the loose and they’re going to be my main focus this Halloween, and what better film to kick off this month then one of Hollywood’s most iconic and treasured Horror movies, its Alfred Hitchcock’s 1963 classic “The Birds”. While there had been several animal attack movies before in the 50’s revolving around giant insects or giant spiders, this was the first that took audiences by total surprise and scared the hell out of them with a concept that no one could have imagined or ignored after they saw the film. The movie begins with a set up that really has nothing to do with the plot, it’s just a way to introduce us to the characters. Basically a woman named Melanie works at a local bird store and one day a customer named Mitch gets her attention. This guys a lawyer and decides to toy with her a little after watching her pull a prank in court. 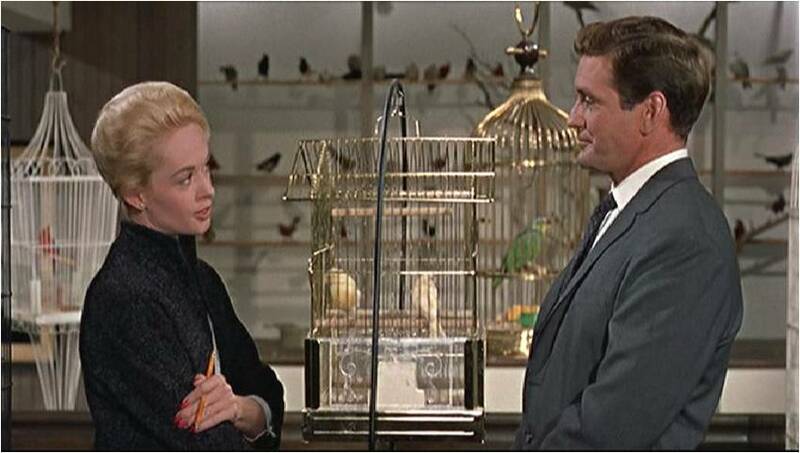 She immediately develops a crush on him and wants to get his attention by playing another joke on the guy involving a pair of caged love birds. 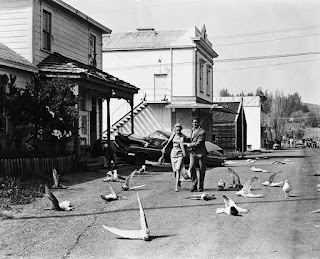 She heads to Bodega Bay in California to leave him his surprise gift when she’s suddenly attacked buy a seagull. The incident doesn’t seem like that big a deal at first and it gives her an excuse to spend some quality time with Mitch and his family. Slowly but effectively, several other small incidents involving birds take place, and soon they begin attacking in full force. The feathered fiends end up running the whole town into hiding, leaving them wondering what the heck is going on, how do we fight back, and most important of all ... how do we survive this invasion. The brilliance of this movie is that it takes something so mundane, even beautiful and turns it into something frightening. Fear is a natural reaction that comes when you encounter sharks or spiders, but birds are just a wonder of nature, they fill the air with beautiful music, they come in a colorful variety and rarely do anything aggressive. 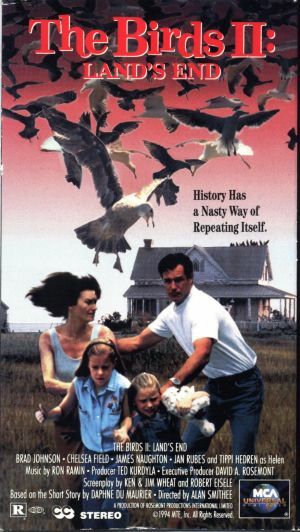 After seeing this film, no one looked at birds the same way again, and I distinctly remember seeing this movie for the first time at a young age and being terrified to go outside thinking that I might just get attacked by a rouge bird. It’s also very alarming because you can’t fight against these birds the same way you can kill a deadly shark like in “Jaws”, and that really raises the stakes. Some of the effects are really cheesy looking by today’s standards and there are some obvious blue screen moments, but I personally found the visuals to be very impressive for the time. In fact, the movie won an Oscar for best special effects. There are a lot of memorable scenes and visuals that just stick in your head long after the movie ends. There’s all those ominous shots of the birds perching themselves on objects and electrical cords, there’s the scenes in which children get attacked, and some scary shots of dead bodies that had their eyes pecked out. One of the best visuals is when Melanie sits on a park bench and behind her we see one bird after another landing on various play ground equipment, then after a long camera hold on Melanie’s face, she slowly turns around and see’s the entire park covered in black crows. 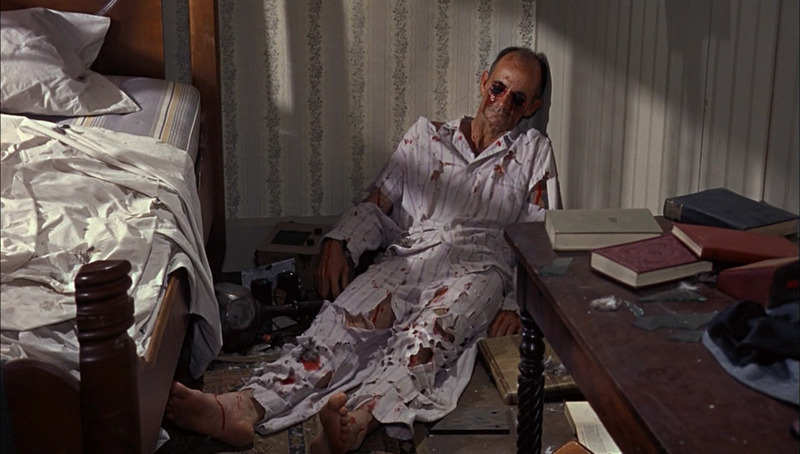 Whenever I think of this movie, that’s always the first image that comes to mind. Now obviously this concept of killer birds is admittedly very silly, but Alfred Hitchcock wasn’t your average campy filmmaker, in fact you can always feel his stamp of quality in anything he dose and “The Birds” is no exception. His method of setting up shots and editing is brilliant but the key ingredient he brings to this film is the buildup. 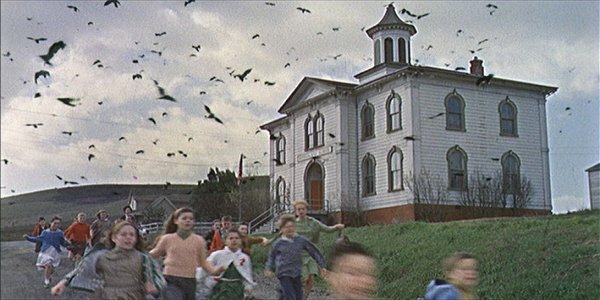 To be honest, the most frightening scenes are all the quiet moments that slowly build up to when the birds actually attack. His style may come off a slow and boring to some people, so you really have to be in the right mind set to appreciate it. 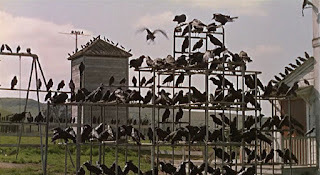 Now I’m not going to lie, there are some really boring scenes in the first half hour of the movie which involves the characters in long conversations that all become irrelevant when the birds finally attack. However, there is some ominous foreshadowing of things to come which is just enough to keep you invested, and when all hell breaks loose, it becomes an exciting rollercoaster thrill ride. The characters themselves all feel like they belong in a different kind of film, like a generic 1960’s romance, but they hold your attention fine, and you do want to see them survive till the end. 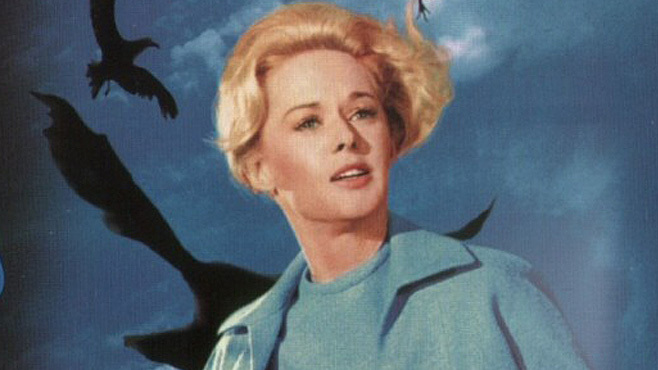 The female lead Melanie is played by Tippi Hedren and she does a mostly serviceable job, looks fantastic on screen, however she does have some really hockey moments. 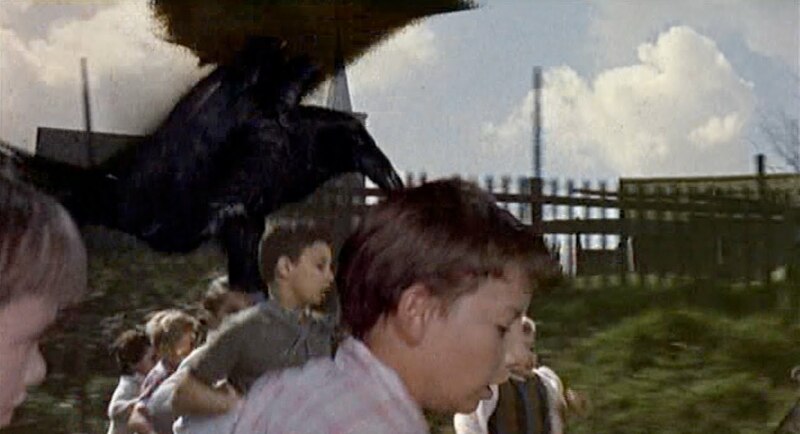 Another great aspect of this film is all the mystery surrounding the bird attacks. 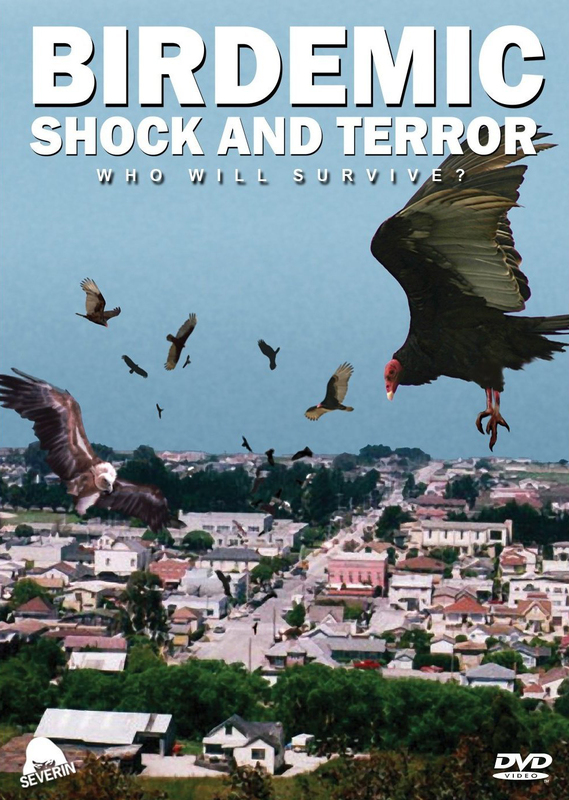 Most monster movies give lots of exposition as to what’s going on and why, but things are never clear in this film, and the characters themselves are almost driven made trying to figure out what’s causing these birds to act so aggressively. 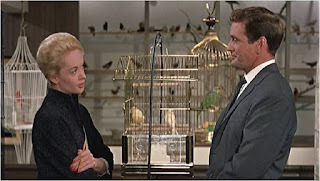 The only red hearing thrown in the equation are the two caged love birds, the movie never tells us that their a prime reason for all the attacks but it does leave you wondering. 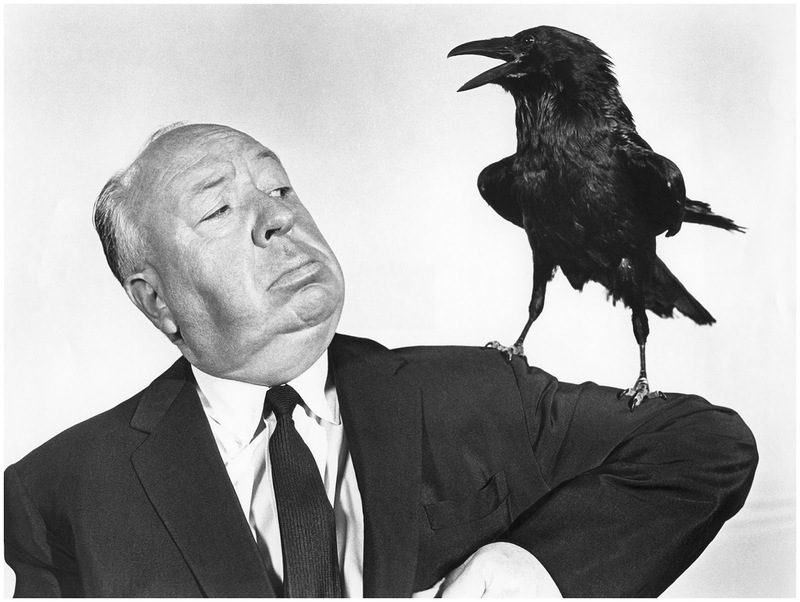 Now obviously Hitchcock is one of Hollywood’s most famous directors, filmmakers and one of the first to receive wide spread attention. I myself can praise his style and direction all day long, but the man himself was admittedly kind of rough around the edges and did some questionable things. 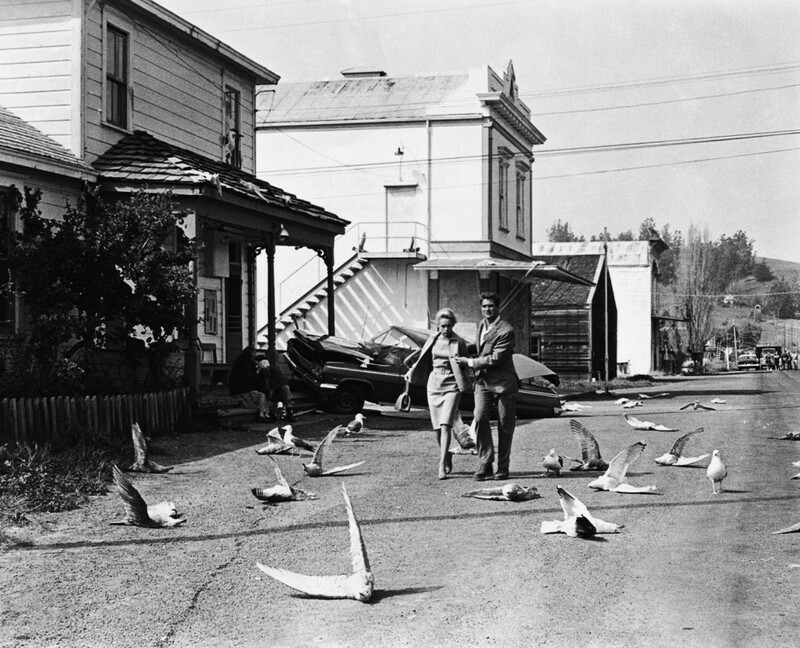 He even had a reputation for not taking good care of his actors while on set, and nowhere was that more obvious then in “The Birds”. 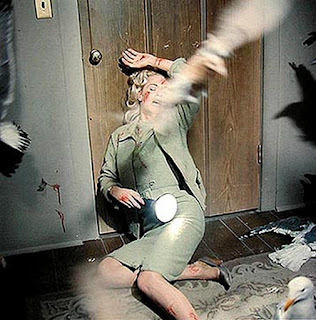 There’s an infamous controversial scene in which Tippi Hedren’s character gets trapped in a bedroom, where she’s attacked by various birds. The scene itself is very disturbing as she gets relentlessly picked apart by the little devils and it almost echo’s back the famous shower scene from “Psycho”, however, something even more disturbing happened off screen. Before shooting, Hitchcock presumably told Tippi Hedren that all the birds in the scene were fake, so it was a real shock for her on the day of the shoot when real life birds started flying all around her in this tight and claustrophobic setting. While the actress wasn’t physically endured, it drained a lot of energy from her and she ended up spending the following week sleeping on her couch in a comatose like state. This further proved that while Hitchcock was a master filmmaker, he was also very careless toured the safety of his cast and crew, which is really hard to glance over. So on that cheery note, let’s talk about some of the actual bird attack scenes, which are admittedly very thrilling and heart pounding moments. There’s the scene in which a flock of crows attack some children at their school and another memorable moment when they crash a birthday party. 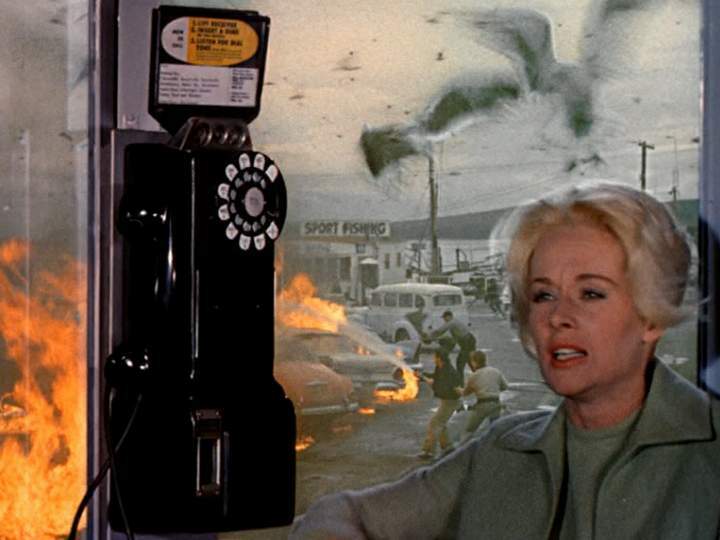 The best scene of all is when the birds attack a gas station. 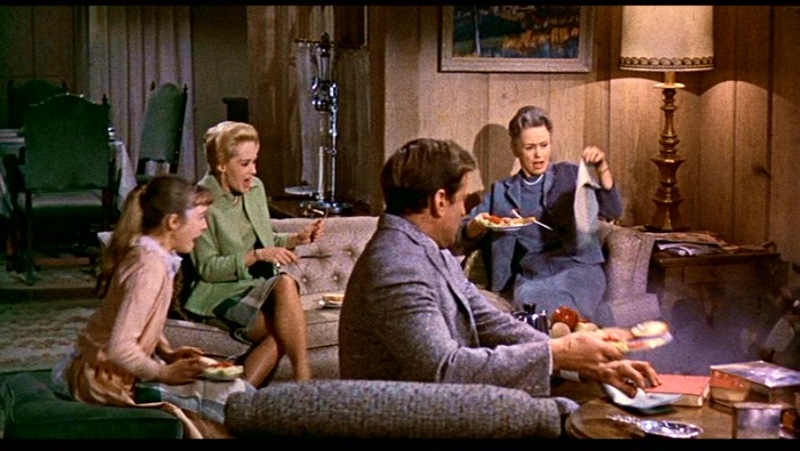 The buildup in this scene is fantastic as all the characters are gathered in a dinner discussing this bird situation and a woman who claims to be an expert on the subject gives us some info on birds in general which only builds on our anticipation. Then without warning, the birds attack the nearby gas station, causing a gas tank to tip over and a chain of exploding cars follow. 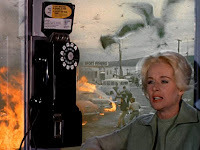 It’s a big spectacle with birds flying all over the place, things are catching fire and our female lead finds herself trapped in a phone booth. It’s the most famous scene of the movie and very effective as your stuck in this tight, claustrophobic phone booth with our star and watching all the chaos unfolding around her. With all the mangled bodies, birds crashing into windows and lots of destruction, this could have almost been the climax of the movie. 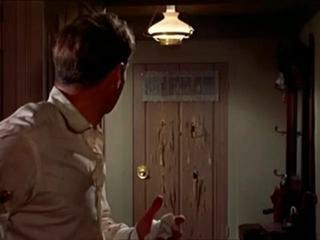 The actual finally takes place in a barricaded house, with our hero’s trapped and fighting off various bird attacks. Both the cinematography and visuals are top notch here and the sounds of screeching birds over head create an eerie mood. Now I feel the need to comment on the ending, so spoiler alert if you care. 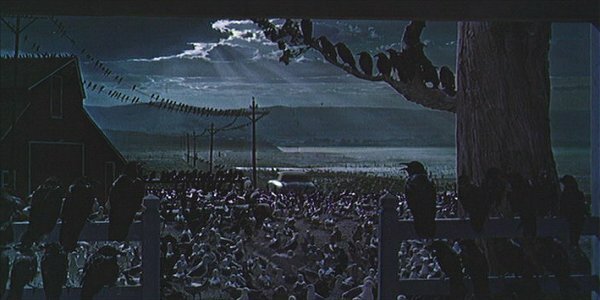 After one of the characters gets endured, our survivors quietly make their way to the car while surrounded by several birds, all the while a radio announcer claims that the mysterious bird attacks are increasing and the national guard is debating on whether they should take action. 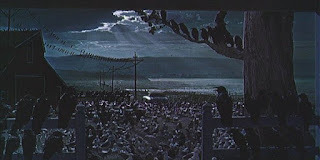 As the car drives off, we get one heck of an eerie shot as birds seem to cover the entire landscape, and just when you think you’re about to follow these characters on their adventure across the country side, the movie abruptly ends. It’s so sudden it doesn’t even feel like a proper conclusion, the movie just stops. This can easily turn some viewers off as it seems to come out of nowhere, and it’s personally my least favorite part of the whole movie. 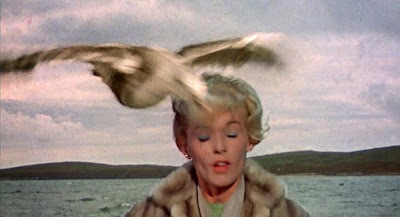 There was a sequel that came out several years latter titled “The Birds 2: Lands End”, but it had little connection with the first and while I personally haven’t seen the film, it doesn’t seem like it captured the same magical haunting touch of its predecessor. While several movies have tried to recreate the formula of man battling animals and nature, there haven’t been too many films focusing on birds as the villains. 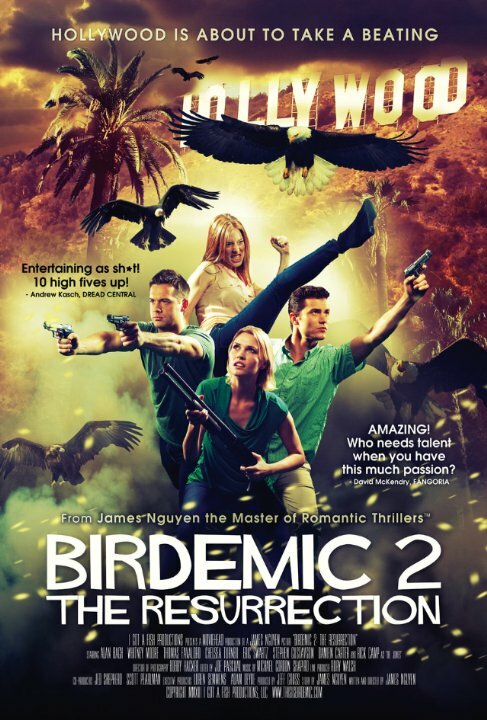 The only other film that comes to mind is a 2010 picture titled “Birdemic: Shock of Terror”, and its sequel “Birdemic 2: The Resurrection”, both terrible movies that used the same premise except with terrible acting, terrible writing and some of the worst special effects ever seen on film. 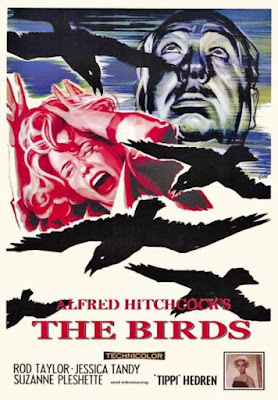 As for Alfred Hitchcock’s 1963 classic “The Birds”, it still holds up great after all these years, it’s one of my favorite movies he ever did and I honestly think it’s the greatest animal attack movie of all time, even better then “Jaws”. While it still has some problems that might keep modern audiences from liking it, there’s still plenty of thrills and excitement that come off so much stronger in this movie then most other monster flicks. You really just need to keep a humble perspective while viewing the film. If you let the atmosphere and build up sink in, you’ll find yourself feeling like your right there in the action, wondering what our hero’s are thinking, dreading another attack and it’s just a really fun ride. While Hitchcock did some questionable things, he was undoubtedly a talented filmmaker with vision, and this is one of his greatest accomplishments in his long legacy of quality films. 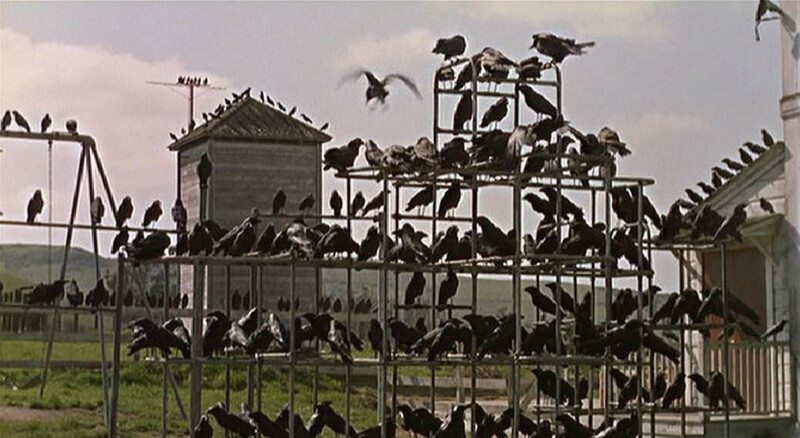 I give “The Birds” 4 ½ stars out of 5. Did you know that you can create short urls with AdFly and get $$$$$ from every click on your shortened urls.